Wednesday 4/3: Craig took one last spin on the Jodhpur last night but has declared the grooming “over” for the season. Ski at your own risk and have a great Spring!! Tuesday 4/2: No grooming today. Enjoy! Monday 4/1: Craig snow machine groomed Elliot’s, World Cup and returned on Margaux’s from World Cup to Stadium = Rollercoaster and Tasha’s. He also groomed Jodhpur. All trails are getting thinner with more dirt, icy spots and water holes. Have a happy April 1st!! 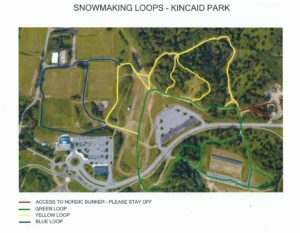 View reports as a map HERE – Clicking on a trail will provide the date it was last groomed, trail color shows level of difficulty and line width shows the days since grooming. Zoom in to see lights along specific trails as well as parking lots and recreation centers. All lighting controls are on timers with photo cell over-rides based on daylight.